Sauteurs Breakwater wins inter-beach swim competition! The action on the beach in front of Umbrellas this past Saturday was chaotic, but fun, as over 150 swimmers with many swim instructors and volunteers showed up on Grand Anse Beach to enjoy a little competition. 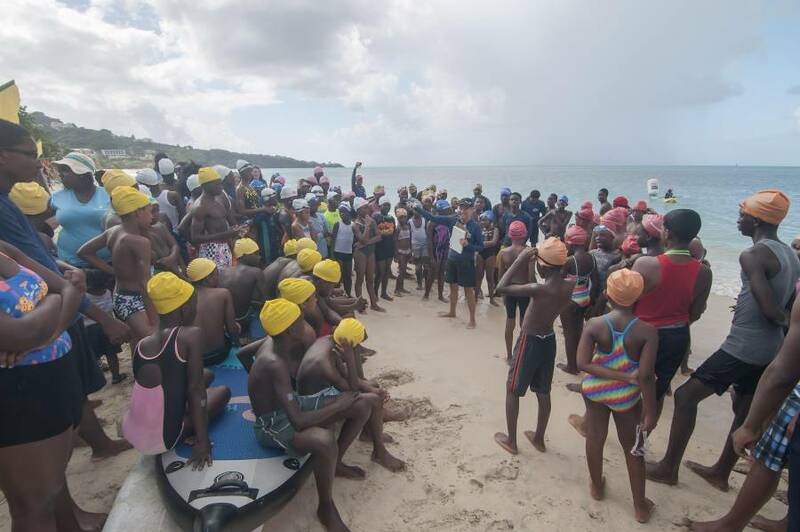 As a part of the free swim lessons now being offered at 8 locations throughout Grenada on Saturdays, a swim competition and fun day were held to bring the various swim clubs together on Grand Anse Beach. Waves were a bit choppy but that didn’t dampen anyone’s spirit. Every team had a coloured cap, so they could be distinguished in the ocean and it was the white caps of Sauteurs Breakwater which were seen winning many races to take home the trophy. Special congrats to Waltham Beach for coming in second place, Fontenoy for third, and Grand Mal and Grand Anse who tied for fourth. Deb Eastwood, Director of Grenada Youth Adventurers (GYA), had this to say. “It was particularly fun to see one of the newer beaches win, as Sauteurs Breakwater has just come into the programme in the last year. We have added 3 new beaches up north in the last 12 months, with Gouyave and Waltham Beach being the other additions. This brings us to a total of 8 beaches offering free Saturday lessons each week.” The Saturday programmes are part of the “Get Grenada Swimming” initiative to teach 8,000 children to swim by 2021.Eastwood says they are almost halfway towards reaching their goal. More about the initiative, along with details of the beaches and coordinators, may be found at www. getgrenadaswimming.com or Whatsapp her at 473-404-5237. Most of the swim locations will shut down over the holidays but start back up in January. The programme encourages adults to come out and learn to swim as well.